Because not all countries are areas observe daylight saving time (DST), it's important to understand what to do when the time changes whether working onsite in a place that observes DST or working offshore, or in a place that does not observe DST. Offshore - What to Do About DST? If you work offshore or in an area that doesn't observe DST, most likely your meeting times will change while those who observe DST will have static meeting times. This is because, your clock time doesn't change (move forward or back), while theirs does. To see some examples of this, view this post on DST and meeting time changes. Onsite - What Does "Changing the Clocks" Mean? In most parts of the US, people will physically change their clocks (moving time ahead one hour for spring ahead, and moving it back one hour for fall back). In the video below, you will see magic happen.... as we literally lose an hour. The time will jump from 1:59am to 3am.... a whole hour... g-o-n-e! 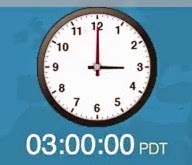 When 2am becomes 3am - It's Spring Forward! Now a days, most time keeping devices are electronic and calibrated to change without a human touch. However, for those who have manual clocks or watches, it's imperative to remember to physically change the time on the gadget, like in the video below. For those who live in places where the time change happens, take note that the sun will rise one hour later after spring forward and set one hour later. Because people enjoy more daylight after the time change, and the sunsets later and later into the summer, many enjoy more outdoor activities after work which are not possible in the winter time.